Red Hat Ansible Tower is the best way to run Ansible in your organization. Red Hat Ansible Tower is more than the web UI and rest API for Ansible. It also centralizes and controls your Ansible infrastructure with a visual dashboard, role-based access control, job scheduling, and graphical inventory management. Tower's REST API and CLI make it easy to embed Tower into existing tools and processes. Heads-up NOC-style automation dashboard displays everything going on in your Ansible environment. Creates the necessary separation and isolation of users and resources. 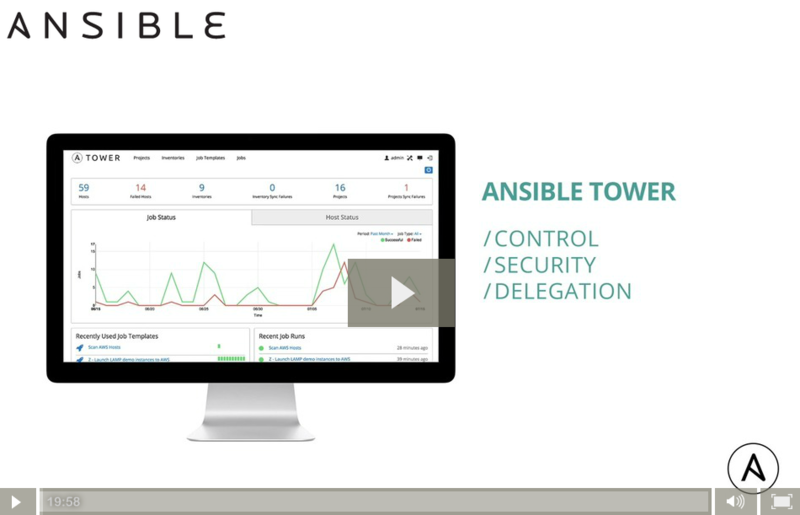 Users can safely use Ansible Tower to work only on the systems in the environments to which they have access. Easily import users, teams, and organizations from your SAML, AD, or LDAP directory, and delegate push-button access to automation with easy question and answer configuration, automatic scheduling, and more. Ansible Tower workfows allow you to chain together different automation tasks to create workflows. Model your processes and deployments natively in Tower, including recovery from failures, chained workflows, and more. Connect multiple Tower nodes into a Tower cluster to add redundancy and capacity to your automation platform, including reserved capacity and remote execution points of presence. Add push-button deployment and scaling when running in Red Hat OpenShift Container Platform. Sync inventory from all major cloud and virtualization providers, or add custom inventory. Integrate with Red Hat Insights to view Insights Alerts and perform playbook remediation. Stay informed of your automation status via integrated notifications, and use the REST API to connect automation to source control, continuous delivery systems, ticketing systems, and more. All automation is securely logged and stored, with a full audit trail. Send logs to external logging and anayltics platforms for detailed analysis and correlations with other alerting and management systems. Your physical or virtual machine should meet the system requirements . Installation will take about 20-30 minutes. Login with the username and password setup during installation. Ansible Tower now includes a default organization*. Users with an Enterprise license can also add their own orgs. Access the organization from the Organizations icon located on the left navigation bar. An 'Admin' user is already added by default by Tower and assigned a System Administrator role. To view the user associated with this organization, click the Users tab from the current organization. This view shows the user and his or her role. This screen shows numerous attributes (permissions, groups, hosts, sources, and completed jobs) associated with the Demo Inventory. For the purposes of this Quick Start, a local host has been added for your use. Click the Credentials icon located on the left navigation bar. A demo credential has been provided for your use. Click on the “Demo Credential” link name or the Edit icon to review or edit this credential. Click the Projects icon located on the left navigation bar. Click on the “Demo Project” link or click on the Edit icon to review the stock project provided by Tower. Click Cancel (if no changes were made) or click Save and use the breadcrumb links in the Tower browser to return to the overview screen. You must manually start an inventory sync for this project before it can be used in a job template. Update the SCM-based demo project by clicking the Sync refresh icon under the project’s available Actions. Review existing jobs or create a new job template by clicking the Templates icon located on the left navigation bar. Click on the “Demo Job Template” link or click on the Edit icon to review the stock job template provided by Tower. Click Cancel (if no changes were made) or click Save and use the breadcrumb links in the Tower browser to return to the overview screen. From the Templates list view, click Launch (rocket icon, under Actions) next to Demo Job Template to run it. Enter any passwords needed, then watch as your job runs (the job page updates in real time). Congratulations! You’ve completed the initial setup and your Tower installation is officially up and running properly. *Starting with Ansible Tower version 2.2.0. 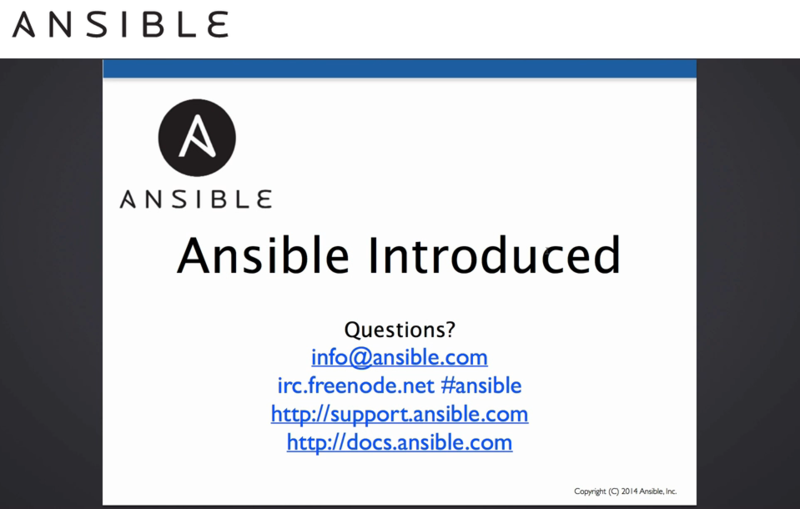 This 35 minute video is a great way to get up to speed quickly on Ansible core.